Apple will provide the iPads, while IBM will develop custom software over the next year, the three parties involved revealed. Watch Over is a niche service started by Japan Post in 2013, under which mail carriers check in on elderly clients, provide consultation, and share information with family members. Calling it a "first-of-its-kind initiative aimed at improving the quality of life for millions of Japanese senior citizens," the program will include IBM apps that will connect the elderly to services, healthcare, community, and their families. 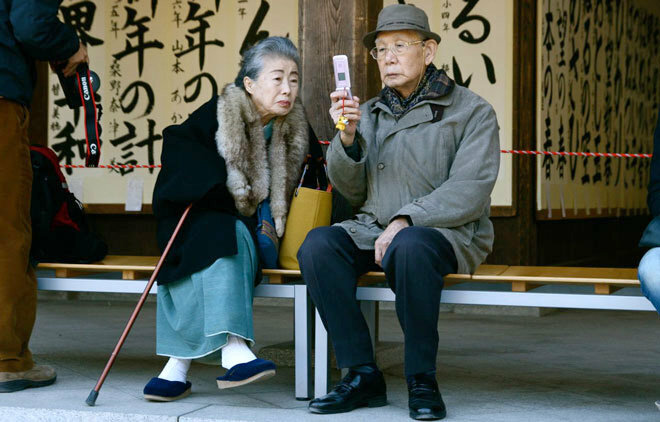 Japan's population includes 33 million seniors, representing about 25 percent of the country's total. "This initiative has potential for global impact, as many countries face the challenge of supporting an aging population, and we are honored to be involved in supporting Japan's senior citizens and helping enrich their lives," said Apple Chief Executive Tim Cook. "iPad is incredibly intuitive, easy to use and has accessibility features built in, making it a perfect device for any generation to be connected and engaged." There are currently only 100 people in the Watch Over program to date, for each of whom it costs 1,000 yen ($8.40) per month, according to The Wall Street Journal. Later in 2015, however, a six-month pilot program will provide 1,000 iPads to senior citizens at no cost. If all goes well the initiative will turn into a business in April 2016, although fees haven't been decided. The goal is to reach 4 million to 5 million Japanese by 2020. Demographically Japan is a rapidly aging country, with one quarter of its 127 million people older than 65. "We are joining with two of the world's most respected leaders in technology to bring our elderly generation into the connected world, expand our businesses by deepening relationships, and discover new ways to strengthen the fabric of our society and economy," said Taizo Nishimuro, CEO of Japan Post Group. The IBM software will remind elderly people to take their medication, suggest diet and exercise changes, and help with tasks like grocery shopping and job matching. The company will also be providing many behind-the-scenes services, such as system integration and training. "What we're starting today draws on IBM's long heritage of innovation at the intersection of technology, business and society," said Ginni Rometty, President, Chairman and CEO of IBM. "The potential we see here--as broad as national economics and as specific as the quality of life of individuals and their families--is one example of the potential of mobile-led transformation anywhere in the world where issues of an aging population exist." The nationwide infrastructure of Japan Post Group and its ability to cover the "last mile" to virtually every citizen of Japan. In addition to 24,000 post offices and a workforce of 400,000, Japan Post Group has existing financial relationships with nearly all of the 115 million adults in Japan. The Japan Post deal stems from Apple and IBM's MobileFirst partnership. Together the companies have developed a range of template iOS apps and services for enterprise, with split support responsibilities when organizations agree to a contract.